A test for bipolar disorder? How ’bout postural sway? A test for bipolar disorder? Not exactly (but it helps). I know – were it that easy. But until a simple test can nail-down an emotional/mental health disorder diagnosis, we’re going to have to rely primarily upon signs and symptoms. By the way, were you ever curious about the difference? It’s simple – signs are what the diagnosing clinician sees, symptoms are what you experience and (hopefully) report. Regarding the signs and symptoms of bipolar disorder (BD), the May 18 online edition of PLoS ONE features a study that suggests a new one. Postural Control and Bipolar Disorder? Okay, it isn’t front page news – be it BD, unipolar depression, or the anxiety disorders – alterations of brain anatomy and physiology are factors. I always say this, but wouldn’t they have to be? A few of the frequent flyers are the basal ganglia, cerebellum, and brain stem (pretend you see a stem hanging down to the left of the cerebellum). And this especially applies to BD. Ready for more? 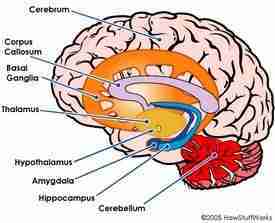 The basal ganglia, cerebellum, and brain stem are also players in postural control. Hmmm. Well,that got Dr. Bolbecker and her brain-trust a-thinkin’. Wouldn’t it at least make sense that postural control issues may be a characteristic of BD? They wanted some answers. So they rounded-up 32 subjects, all age 38. 16 had BD (a portion on meds) and the others had no psych diagnoses. What did they do with them? They asked them to stand as still as they could for two minutes on a force platform (measures ground reaction forces generated by a standing or moving body). And if that wasn’t enough, the subjects were asked to do so with their eyes open and closed. Recorded and analyzed were postural sway changes, which are caused by muscle contractions involved in maintaining proper posture. Postural sway is a reliable indicator of levels of dysfunction in the inter-workings of the basal ganglia, cerebellum, and brain stem. Reduced Postural Control (and more)! Well, wouldn’t you just know it. Ding, ding, ding – the BD subjects presented with sway results consistent with reduced postural control. Furthermore, this was particularly the case when the BD subjects were asked to stand with their eyes closed – having no visual input. That particular piece provided the research team with a bonus. It suggested that those with BD have deficits in sensorimotor integration and issues with making postural corrections. Another possible explanation is the BD participants have a reduced ability to integrate and utilize proprioceptive information for motor control. Proprioception is a very cool dynamic. It’s the sense of the relative position of neighboring parts of the body – the perception of the pain and movement of internal organs. Here’s a link to a piece I wrote some time ago that’s a great fit here – Agoraphobia, Panic Attacks, Spatial Orientation: Perception is Everything. Mood & Motor Disorders: Two Peas in a Pod?! Though the relationship between the mood and motor disorders merits much more research – there’s definitely a fit. But that should be of no great surprise. The word emotion is based in the Latin, emovere – which roughly translates into movement. More evidence? Think about Parkinson’s Disease. Isn’t depression a common feature? Okay, who wouldn’t be devastated by a Parkinson’s diagnosis. But the presenting depression is likely endogenous (of deeply internal origin), as opposed to situational. The detection of any sort of motor disorder may be of great assistance in confirming a diagnosis of bipolar disorder – and other mood situations. The relationship between the mood and motor disorders appears to be very real – and merits additional research. It seems as though the research community is stepping-up to the plate in terms of emotional/mental health work. chipur helps so many more people when comments are offered. What’s on your mind? Dr. Bolbecker’s work was funded by grants from the National Institute of Mental Health, the National Alliance for Research on Schizophrenia and Depression, and Young Investigator. Previous Post: chipur Update: Viibryd is coming when?? ?